The ukrainian pilot with only 8 years old recovered 13 places in the Final 2. Luka Fedorenko was one of the main protagonists on the first round at the mediatic Spain Karting Championship at Alevín category, attended by 20 participants. The young ukrainian pilot - who just completed 8 years old in February - despite starting from 17th position at the Final 2, recovered 13 places and saw the chess flag in a remarkable 4th place, reaching the fastest lap on the race, 1m13,290s, at the imposing Motorland’s racetrack which has an extension of 1671 meters. 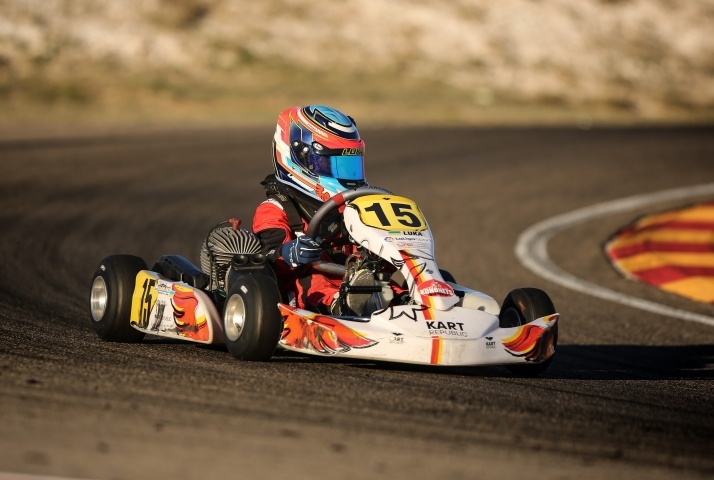 Luka Fedorenko – who won the Portugal Rotax Max Challenge in 2018 at the Micro- academy category –, do not let himself be affected by the incident at the Final 1 which forced him to leave the race right after the beginning and at the final 2 he led a memorable race. "This was my first race in a such important championship. I’ve only practice once time alone at Motorland’s track. It was 3 weeks ago and I didn’t know who were the most competitive opponents. The first day at the competition, on Saturday, didn’t go so well and neither the Final 1 on Sunday, regardless of recovering some places at the beginning, an incident forced me to leave the race. At the Final 2, I started in 17th place, I was able to recover 13 places and had finished at 4th place. I even got the fastest lad at the race. I’m very happy with this result.”, said the young ukrainian pilot, who about a month ago completed 8 years old, while his parents, showing their fair-play, preferred to highlight that there are others important things than the races. “Beyond Karting there are other important things during a weekend of racing. Luka use to play around with other kids – who doesn’t speak the same language – and this interaction between them is priceless! We appreciate the work and effort of mechanics Márcio and Alexander and we congratulate the other drivers who also do good races”. Luka is going to dispute the others four rounds at the Spanish Karting Championship – the second one its schedule to April 26, 27 and 28 in ‘Recas’ racetrack, next to Madrid -, The “Benelux lame” that is going to be in France, Netherlands and Belgium, and at the Luka’s sportive schedule are also planned some practices in Italy, so that in the future he can conquer in the most wanted competitions at World Series Karting (WSK). A promising future for Luka Fedorenko.